Miller High Life beer serving tray 12" diameter. Shows typical usage and edge wear. There are scratches, flakes and rust usually found on trays of this period. 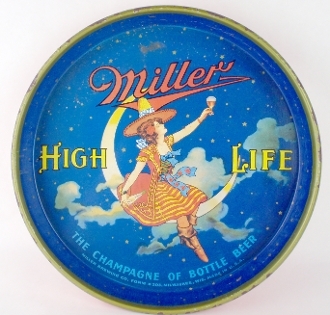 Miller 'Maid in the Moon' beer tray featuring the Moon Maid in her great multi-cultural costume & sombrero, offering a toast to the cosmos with the 'Champagne of Bottle Beer - Miller High Life!' Maker marked Miller Brewing Co. in Milwaukee, Wisconsin circa 1950s. Will display nicely.